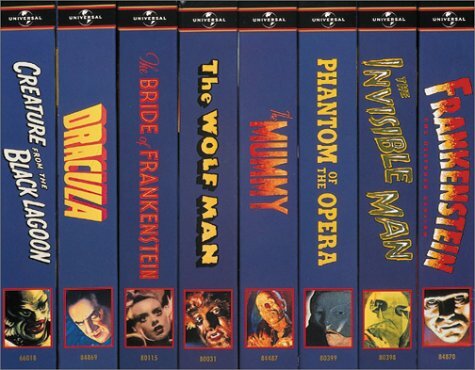 Universal Studios' Classic Monster Collection. Boxed set of 8 B&W, VHS tapes in sleeves. Contents: Karloff in "The Bride of Frankenstein" (B&W, 1 hr 20 mins); H.G. Wells' "The Invisible Man," with Gloria Stuart and Claude Rains (B&W, 1 hr 11 mins); "Creature from the Black Lagoon," with Richard Carlson and Julia Adams (B&W, 1 hr 19 mins); "The Mummy" with Boris Karloff (B&W, 1 hr 14 mins); "The Wolf Man" with Claude Rains (B&W, 1 hr 10 mins); "Phantom of the Opera" with Nelson Eddy (B&W, 1 hr 33 mins); "Dracula" with Bela Lugosi, David Manners (B&W, 1 hr 15 mins); and"Frankenstein" with Colin Clive and Mae Clarke (B&W, 1 hr 11 mins). If you have any questions about this product by Universal Studios Ho, contact us by completing and submitting the form below. If you are looking for a specif part number, please include it with your message.